Don S. writes: I have posted queries about this coin on a few discussion groups and no one has come up with a definitive identification. I looked through a number of catalogues, but to no avail. Some people think it is South/Central American, some think it is provincial German, but no one has seen this exact item. It may well be a reproduction or counterfeit, but I am curious as to what it is a counterfeit of? The item is about one half inch in diameter and appears to be made of brass (although one person suggested it may be very low grade gold. The hole is recent. The legend on one side, which apears to be a ship, says “Plus Ultra” which would correspond to both the Spanish and German theories. The legend on the other side appears to be German and says “II UBER * REC II . PFE * II .” (stars and dots included. the image appears to be stars bursting from the ground. You have a “jeton”. 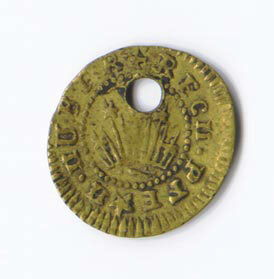 This token was used as a game piece or “spielmark” or as a method of counting. The Latin “Plus Ultra” (more beyond) was a feature on Spanish 8 reales which were a world monetary standard through the 16th to the 19th centuries and would be a fitting legend to borrow. Jetons often borrowed segments of coin designs just like play money. I would guess this jeton is plated brass c. 18th century. The hole in the token is modern, maybe to use on a chain as jewelry. To learn more about jetons, use the CoinSite Search engine and search for “Jeton”. Is it possible for double-die to occur on a proof?Medieval "bracteates"